Description The Edmonds Cookery Book has been loved and trusted by New Zealand families for almost 100 years. Everyone has an Edmonds recipe to which special memories are attached; we undertook a national quest to collect these special recipes and put them all together. The outcome: Edmonds Classics. Complete with Edmonds famous 'handy hints,' snippets of Edmonds history and recipe trivia this is t only a great piece of Kiwi kitchen stalgia, but an invaluable collection of loved and reliable recipes. 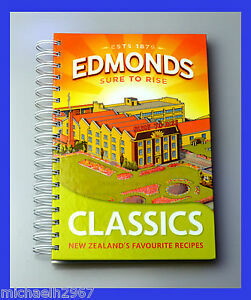 Edmonds Classics pays tribute to the recipes and memories of the New Zealand kitchen. Author Biography Since 1907 the EDMONDS COOKERY BOOK has been providing New Zealanders with 'economical recipes and cooking hints'. This title remains in the bestsellers lists today. Content Note 16 pp colour ill. I give this book 5 stars plus.......for it's ease of understanding (we are not all great cooks) the method of creating the recipes and the recipes themselves..........which are "down to earth" every day recipes.......that most people enjoy every day. A great classic. Fantastic, old school, beautiful recipes, thanks. All in all a great basic recipe book, easy to follow for a basic cook like me ...fantastic!